If your goal is to be nice all the time you must look away from injustice. If your goal is to be popular in the social network, don’t take an unpopular stand or make an unpopular statement. If you want to be like Jesus, you have to give up on being nice all the time because we live in a fallen and corrupted world. Part of your time will be spent stating the truth in a pleasant manner that is easy for others to receive. Sometimes you will need to, “Be angry and sin not”. 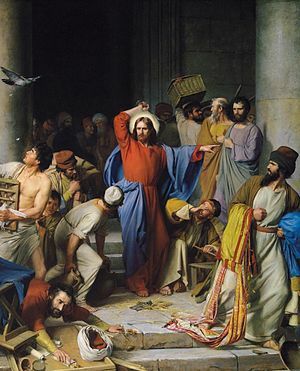 Jesus knew the tables of the money changers in the temple needed to be overturned in a way that would dislodge greed that was rooted by those in power. The guys making the money were there because the religious elite allowed it, who no doubt took their cut of the money too. He wasn’t being very nice, was He? Was it not because the Good Shepherd was busy driving off wolves? Courage in the face of taking unpopular stand in an enormously risk laden situation is what made Jesus a Good Shepherd. And He ultimately laid down His life for His sheep. Still think you have what it takes to be like Jesus? Or consider the Apostle Paul in Galatians when the pure truth of the Gospel was threatened by a group from James, the brother of Jesus . These guys wanted to add a single work of the law to the finished work of Christ’s cross and told the Galatians this as well. He said a lot more colorful things than that as well, but you should really read it for yourself. Take a challenge and just count the disproportionate amount of exclamation points and question marks contained in this small book of the Bible. You will be left thinking the same thing I was. Paul wasn’t being very nice either was he? But Paul also wrote the famous Love chapter in 1 Corinthians 13. Was he out of character? Consider the precious blood of Christ and what it cost to buy us back from eternal judgement and separation from God. Love isn’t always nice. But it is always right. thank you,take care and God bless. thanks for sharing,God bless.one problem did’nt see the post on your site,maybe try again. There was a hiccup. All it posted was my comments. thank you for sharing your thoughts,take care and God bless.